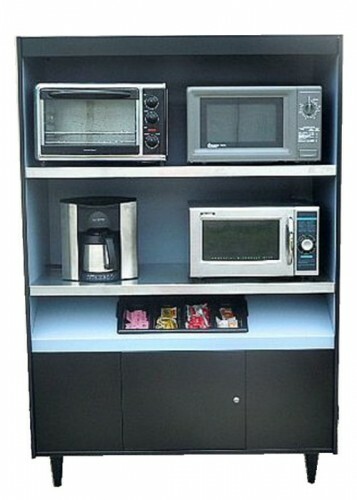 So why didn’t we call these “Microwave stands” or “Microwave cabinets” instead of condiment stands? They do a good job with condiments, but they are perfect for hosting from 1 to 6 microwave ovens. With 20 amp plug-ins and a long heavy duty power cord, they really do get the job done. “Our Line-up” of AS 272 microwave / condiment stands shows the versatility of this product line. All of them are equipped with 20 amp electrical receptacles for use with today’s microwave ovens. They may be ordered with or without lights, most want them without. Whatever your needs, All State is ready to assist should you have any questions. Call 1-800-274-2428 today. 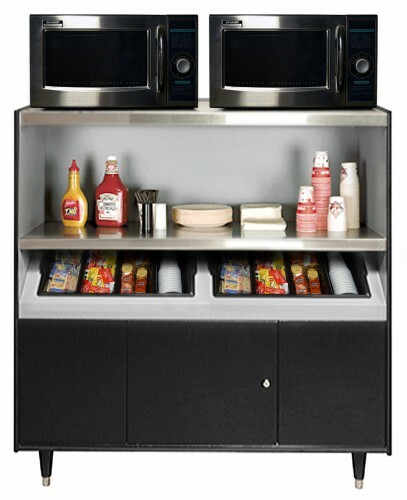 AS272 HT-N/L Condiment stand for up to 2 microwaves, with condiment tray plus storage. Fits snugly between vending machines. 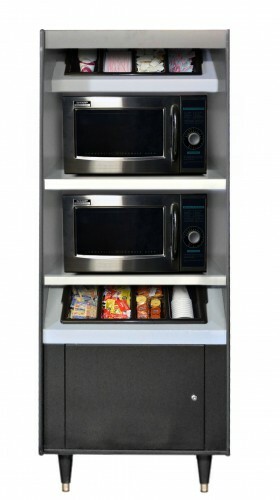 Equipped with 20-amp receptacles to accommodate 2 microwaves. AS272-N/L Condiment stand for up to 2 microwaves, with condiment tray plus storage. 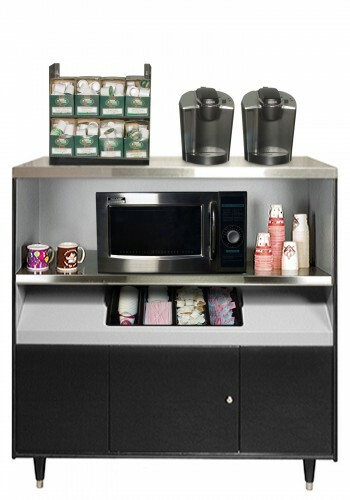 AS272-5-MT-N/L Condiment stand for up to 2 microwaves, with 5 stainless steel cups for utensils or condiments. AS272-2-N/L Condiment stand for up to 2 microwaves, with 2 trays for condiments. 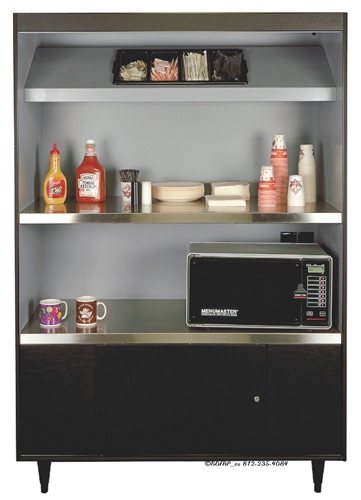 AS272 HT-5-N/L Condiment stand for up to 2 microwaves, with 5 stainless steel cups and 1 tray with 4 compartments for condiments. Fits snugly between vending machines. 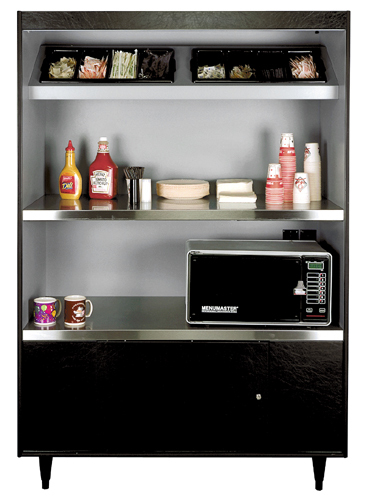 Now you can have a prep area and room for all of those condiments and utensils. 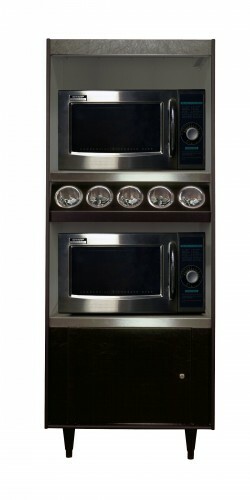 Equipped with 20-amp receptacles to accommodate 2 microwaves. AS273-N/L Our newest condiment Stand for up to 3 microwaves. If you are a little tight on space, or just need more prep area, this is the stand for you. 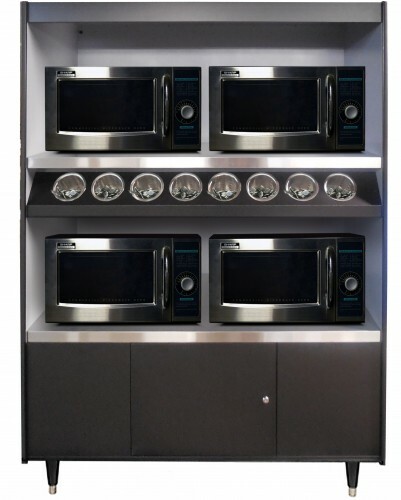 Equipped with 20-amp receptacles for 3 microwaves. Units feature 20-amp receptacles and can accommodate up to 4 microwaves. 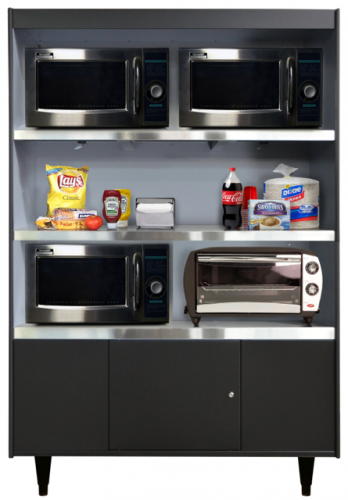 Units feature 20-amp receptacles and can accommodate up to 4 microwaves. Includes 8 stainless steel condiment cups. Painted in the new platinum look this unit has a clean fresh look. Units feature 20-amp receptacles and can accommodate up to 4 microwaves. Includes 4 stainless steel condiment cups and 1 4 section condiment tray. Lots of room for a variety of appliances. 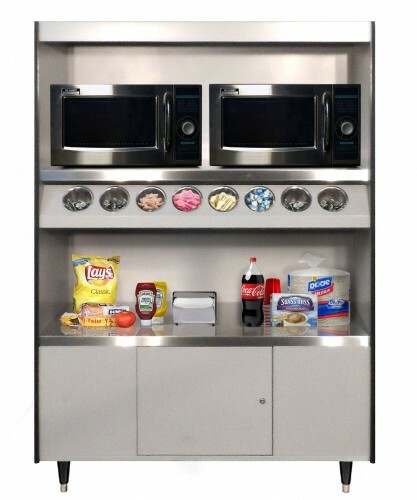 AS493-6 The ultimate space saving Condiment Stand. 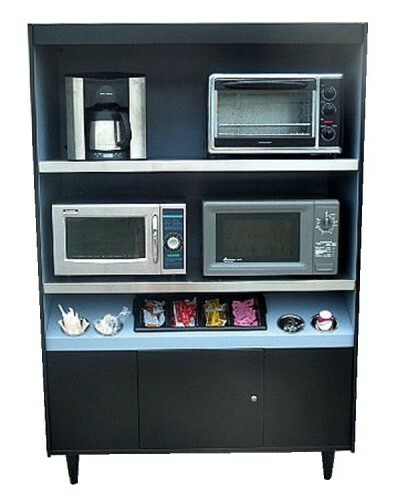 This unit with three stainless steel shelves will hold up to 6 microwave ovens. There is still plenty of room for bulk storage down below. Use your creative skill to configure as you see fit. Our latest buyer is going to use the top shelf for microwaves, the second shelf open for a prepping station, and the bottom shelf for easy access to condiments and accessories. The bottom two shelves are 13″ high. The top shelf is 15″ high. This low-top unit provides storage and counter top space for coffee brewers, microwaves and condiments. Short-stop 1/2-inch lip keeps items from falling off top. Includes 20-amp receptacles. Distributors: Find product photo files here.